Chris Morton and Ceri Thomas have journeyed all over the world meeting people who could tell them about the crystal skulls, including the indigenous peoples, psychics, archaeologists and scientists. This text reveals their acquired knowledge from the travels. The crystal skulls are a mystery as profound as the Pyramids of Egypt, the Nazca Lines of Peru, or Stonehenge. Many indigenous people speak of their remarkable magical and healing properties, but nobody really knows where they came from or what they were used for. Were they left behind after the destruction of a previous world, such as Atlantis? Are they simply ingenious modern fakes or can they really enable us to see deeply into the past and predict the future? Searching for the answers takes the authors on a fantastic odyssey through both the physical and the spiritual world. After hearing stories of an old native American legend that describes the existence of thirteen ancient crystal skulls, that are said to speak or sing and hold important information about the origins, purpose and destiny of mankind. The authors set out on their own quest to find the truth about the skulls. They encounter psychics, UFO hunters, shamans, mystics and medicine men on a journey of discovery that takes them from the British Museum in London to the deserts of the United States, from the science labs of Hewlett Packard to the cold snows of Canada and the tropical jungles of Mexico, Guatemala and Belize. At sacred gatherings of native elders they learn of ancient wisdom kept secret for hundreds, if not thousands, of years. They hear of startling prophecies concerning events that will happen on this Earth in the immediate future, prophecies that question the very survival of the human species on this small island we call home. This is the story of their remarkable discoveries. 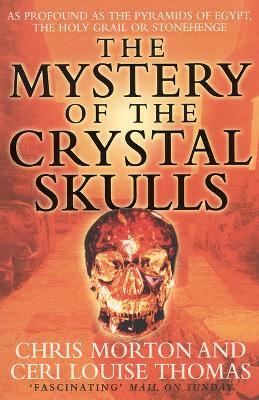 If you find yourself captivated by the mysteries and possibilities surrounding the crystal skulls, you absolutely must get a copy of this expertly written, engaging, and sometimes disturbing book. Chris Morton and Ceri Louise Thomas are independent television producers who specialise in making films with a philosophical, spiritual or environmental emphasis. Their highly-acclaimed documentary `The Mystery of the Crystal Skulls' has recently been shown on BBC1 in Britain and on the Arts & Entertainment Network in the USA and Canada, and has subsequently been sold to numerous television stations around the world.